Chesley Women's Institute was organized in 1910 with 60 ladies in attendance. One of their first petitions was to ask Council that sidewalks be snowplowed and that butcher shops and bakeries be inspected. During the First World War they disbanded to do their work through the Red Cross. 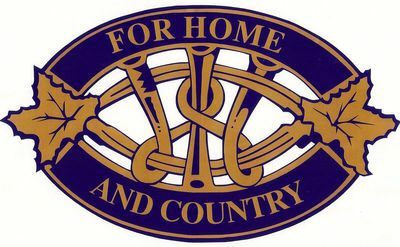 Then they re-organized in 1921 and continued to serve the needs of the Town of Chesley until 1999. The WI members took an active part in providing leadership for activities in the community. Some of their achievements were: providing milk for school children, supplying eye glasses and crutches, raising funds for the War Memorial, supporting the movement for a local hospital and later providing items to the hospital. Riverside Park is located on the banks of North Saugeen River. 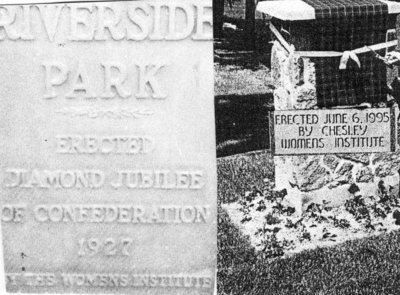 In 1927, gate pillars were erected at Riverside Park and the WI had a bronze plaque with the wording: "Riverside park, erected Diamond Jubilee of Confederation 1927 by the Women's Institute." The plaque which had been placed in the gate pillar in 1927 was re-dedicated in a Cairn which was erected by the Chesley WI on June 6, 1995. The Town of Chesley is located in the Municipality of Arran-Elderslie, Bruce County. For commercial use, please contact the copyright holder for permission and details.